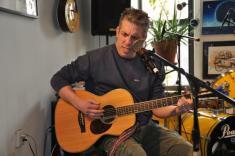 Steve Silver, California bred and now Evanston native joined us and performed some of his songs. My favorite was "Train Town". It reminded me of my Dad and I builing a model train setup in the basement long ago. An acclaimed advertising copywriter, Steve found additional creative release in the tenor sax, which he played for two decades. But on the heels of a divorce, he realized it was easier to tell stories without a mouthpiece in his face and he has been a prolific singer/songwriter ever since. His first album was released in 2013. He is currently working on his fourth. He has played stages all across the country, but he lives in Evanston, Il.